Nothing can relax and soothe you like a soup does, when you are trying to beat the cold temperature outside. It is the most comforting food and not to forget, healthy and delicious too. 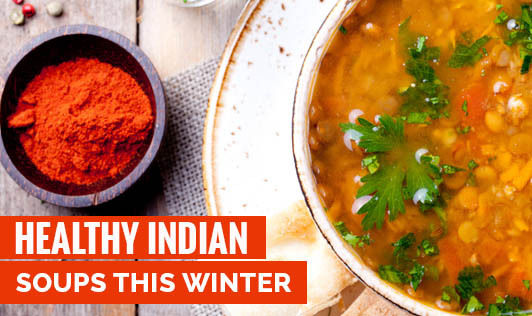 • Take tamarind extract, add chopped tomatoes, turmeric powder, crushed pepper, cumin, garlic, salt and curry leaves. Boil them together. • Once it starts boiling, keep the flame low and let it simmer for 10-15 minutes or until the raw smell of the tamarind goes away. • Heat a teaspoon of ghee and add mustard seeds to it. When it begins to splutter, add the red chilli, curry leaves and pour it over the rasam. Garnish with fresh coriander and serve hot. 1. Finely chop vegetables, blanch and refresh. 2. Prepare coriander stock with fresh coriander and water. 3. Remove coriander from it and add blanched vegetables to it. 4. Add salt, lemon juice and pepper. Serve hot!